I am most active in the field of terrestrial planets and asteroids collisional evolution. Their rocky surfaces are sort of "snapshots" of the bombardment history of the inner solar system. One may say that early processes in the solar system that are no longer observable are locked into cratered terrains. By studying these battered surfaces one may gain insights on the magnitude and frequency of early collisions in the inner solar system, including our own Earth. • External collaborator of NASA MESSENGER Geology Discipline Group. Ceres, the roman goddess of agriculture and harvests. Ceres, the modern dwarf planet, which thanks to the Dawn spacecraft is returning a harvest of discoveries. It all began on January 1st 1801 when astronomer and priest Giuseppe Piazzi spotted from the Royal Observatory of Palermo, Sicily, a moving object among the fixed stars. At first mistaken for an uncatalogued star, then a comet, the moving object – later to be named Ceres – was then thought to be a new planet. By the time other moving objects in this region were discovered, they were all referred to as “asteroids”, a term of Greek derivation for “star-like”. This story is about the elusive nature of Ceres: a characteristic that still endures. Ceres, in fact, is a transitional object. With its 940-km diameter, Ceres is the largest object between the orbit of Mars and Jupiter. It resides at the boundary between the inner solar system – characterized by the rocky planets – and the outer solar system – characterized by the gaseous giant planets. It seems to contain significant amounts of water ice, along with other unexpected minerals, such as ammonium-rich clays, carbonates, salts. From recent observations we also know that Ceres lacks the scars from large collisions that should have scoured its surface over the history of the solar system (Figure 1). Did Ceres perhaps manage to dodge these cosmic bullets? We predict Ceres should have 10-15 craters larger then 400 km, and at least 40 larger than 100 km. Instead, we find none and 16, respectively. Thus, the lack of collisions with Ceres seems very unlikely. Figure 1. (a) Mollweide projection of all impact craters >100 km (~170) expected to have formed since 4.55 Gyr ago. The picture shows a representative Monte Carlo simulation for the nominal model. Colour code provides epoch of formation. While old craters are obliterated by subsequent cratering, empirical saturation shows that some 40 craters >100 km should be retained. (b) Mollweide projection of a Ceres global mosaic showing observed 16 confirmed craters >100 km (yellow lines). On the other hand, there is growing evidence that Ceres was hit by a very large asteroid. This evidence comes from the overall flatness of the topography over large scales implying that the dwarf planet's surface is relatively smooth. Good examples are the smooth terrains near the 280-km diameter Kerwan, the largest well defined impact structure, which extends from East to West for about 1,000 km. Intriguingly, by looking carefully at the global topography we found a very degraded 800-km-wide depression that could be a relict impact structure (Figure 2). While we cannot be sure about the true origin of this feature, this would be compatible with the collisional models. And extrapolating from one such enormous impact structure, many more of smaller diameters are expected, as indicated above. Thus, let's for now assume that a significant population of large cerean impact craters did form. What happened to them? Is it possible that their scars were healed beyond recognition over the eons? Figure 2. The top of this false-color image includes a grazing view of Kerwan, Ceres’ largest impact crater. This well-preserved crater is 280 km wide and is well defined with red-yellow high-elevation rims and a deep central depression shown in blue. Kerwan gradually degrades as one moves toward the center of the image into an 800-km wide, 4-km deep depression (in green) called Vendimia Planitia. 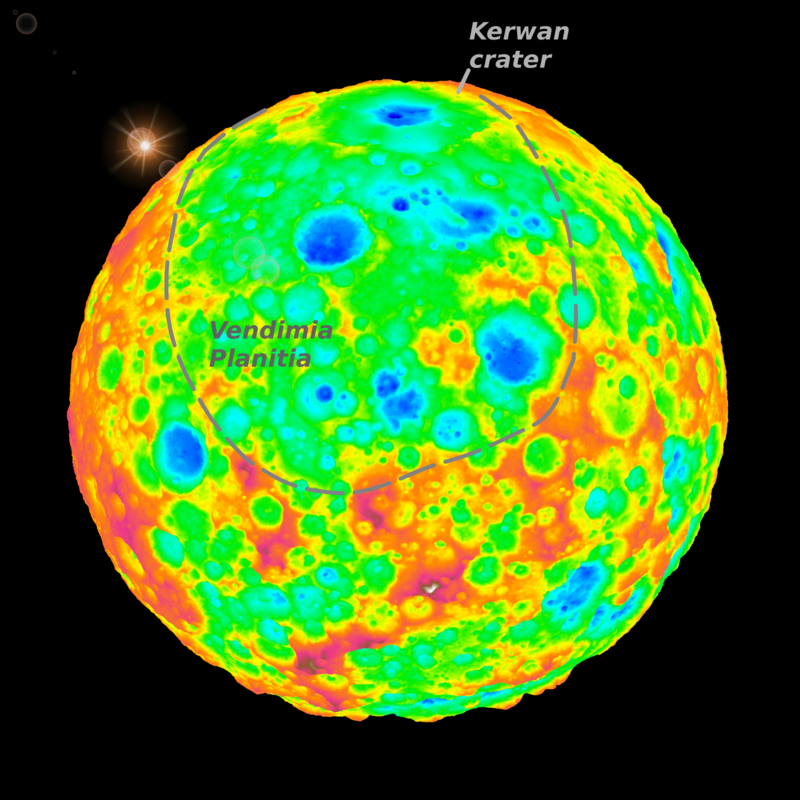 This depression is possibly what’s left of one of the largest craters from Ceres’ earliest collisional history (click on image for higher resolution). Sorry, your browser does not support the video tag! Figure 3. The animation shows both visible (left) and topographic (right) mapping data from Dawn (click here to enlarge in a new page). No matter how odd this may seem, the answer is yes, it is possible. Dawn is gathering evidence of the presence of a significant amount of water ice (20-30%) in Ceres' subsurface. Ice is known to be mobile under the right temperature conditions, and therefore can deform in such a way to fill in depressions such as deep, fresh craters (although there are differences, think of a terrestrial glacier as an example). The presence of weak materials such as clays, and antifreeze like salts and ammonia can also enhance landscape deformation. Over a long time scale (hundreds of millions of years to billions of years) these processes could remove large craters. Alternatively, it is possible that Ceres was an active body in the past, characterized by the presence of cryo-volcanoes (that is, ice volcanoes). This is partially supported by the presence of intriguing massive carbonates deposits at the surface and a 4-km tall isolated mountain. Cryo-volcanoes could have erupted low viscosity materials potentially capable of burying pre-existing impact structures. At this stage, we don't know which one of the processes above is more likely responsible for the flat topography and lack of large craters. It is even possible that there may be additional processes that we have not thought of yet. Regardless, the emerging picture is one in which Ceres' peculiar internal structure and composition is responsible for shaping its surface and its cratering record. All of this is way more intriguing than many of us had anticipated. This research was published in the July 26th 2016 issue of Nature Communications (here). I have discussed in a previous post (here) how the early Earth's evolution was presumably largely influenced by the myriad of collisions with debris leftover from the planetary formation process. Excavation, mixing, and melting of terrestrial rocks are some of the most obvious outcomes of these collisions. The largest impacts are also associated with more profound and enduring effects to the overall tectonic regime of the Earth, and its thin atmosphere. Here we focus on the latter. Collisions certainly produce havoc, whose effects in the case of large impactors – 100s km in diameter or larger – can be global. The largest, most energetic collisions could also have resulted in complete vaporization of the oceans and production of a hot, transient silicate-rich atmosphere. As the atmosphere cools off, molten rock droplets precipitate down followed by heavy rains. The picture of an incandescent sky with pouring hot rock is rather hellish. It is anticipated, however, that over a time scale of thousands of years, the Earth will restore to pre-impact surface conditions. Collisions may also have a more enduring effect on the atmosphere. This is associated with the production of impact-generated volumes of molten rocks. For impactors larger than ~100 km or so, most of the molten rocks are derived from the Earth's mantle. These volumes spread onto the surface encompassing large areas, creating literally lava lakes. This is somewhat analogues to the emplacement of the so-called large igneous provinces, or on a much smaller scale, to volcanic lava eruptions. As a rule of thumb, a 100 km impactor is estimated to produce a lava lake with a diameter of 1,000-2,000 km. Certainly, the spreading of large volumes of lava produced also temporarily hellish conditions, at least locally. Figure 1. An artistic conception of the Hadean Earth. Huge, impact-generated lava lakes coexisted with surface liquid water, under a thick greenhouse atmosphere sustained by lava outgassing (credit: SwRI/Simone Marchi, Dan Durda). There is, however, an interesting twist to the story above. Molten rocks release dissolved volatiles such as carbon dioxide, water, etc. These gases have the potential to alter the atmospheric composition and, thus, have consequences for the environment. It is well documented that large volumes of carbon dioxide released by volcanic eruptions in recent times may have appreciably altered the surface temperature. Similarly, out gassing of impact generated lava lakes could have released significant amount of carbon dioxide and other greenhouse gases (Figure 2). Figure 2. A large impact creates a transient high temperature atmosphere (left panel). Within a thousand years, the atmosphere condenses (middle panel), while deep-seated, impact-generated melt spreads across the surface (right panel). The model shows how pools of lava could release gases and create a greenhouse effect that warmed the planet. Interestingly, the environmental effects of the released gases could last much longer than the post-impact, hot transient phase discussed above. Also, the cumulative release from multiple impacts could build up high concentrations of atmospheric greenhouse gases. An increased budget of atmospheric carbon dioxide implies higher surface temperatures. While we do not have precise knowledge of the surface conditions during the Hadean and Archean (3.5-4.5 billion years ago), it has been postulated that the Earth could have been in a frozen state due to reduced solar luminosity at visible wavelengths. This is known as the famous “faint young Sun paradox”, introduced by Carl Sagan and others in the 70's. However, ancient zircon crystals in sedimentary rocks provide evidence that our planet had liquid oceans, at least intermittently, during this earliest period. This would imply the presence of elevated atmospheric levels of greenhouse gases, such as carbon dioxide and methane, to counter balance the weak light from the infant Sun and sustain liquid water. With the aid of numerical simulations we have shown that the release of greenhouse gases such as carbon dioxide may have been sufficient to temporarily offset weaker insolation from the faint young Sun. Depending on the timescale for atmospheric carbon dioxide drawdown, impact-induced outgassing could have sustained clement surface conditions episodically (1–10 millions of years) or for a protracted time (100s millions of years). Thus, the picture emerging is one in which after transient havoc of a hot, silicate-rich atmosphere has passed, impact-generated melt outgassing could have substantially altered surface conditions. The bombardment also redistributed, or delivered to the surface and subsurface, carbon and sulfur, both important elements for life with important implications for oceanic pH and early metabolic chemistry. Our work supports a view of the early Earth in which impacts were responsible for environmental catastrophes (local or global, depending on the impactor size), followed by more benevolent global effects (Figure 3). Figure 3. 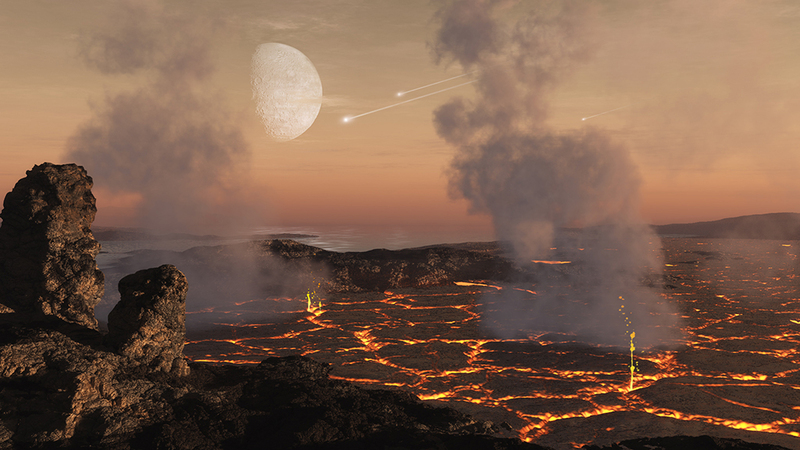 This artistic illustration shows how the early Earth might have looked under bombardment, with circular impact features dotting the daylight side, while hot lava glows on the night side. A thick, yellowish hazy atmosphere is also present. This research was published in the September 1st 2016 issue of Earth and Planetary Science Letters magazine (here). Researchers debate what the early Earth's surface looked like, and when life first originated on Earth. Such quests are inextricably linked to the environmental conditions after the Earth was fully formed, about 4.5 billion years ago, and how the surface evolved over time. Some researchers argue that the early Earth was an inhabitable place being continuously hit by asteroids and comets left over from planet formation. Other researchers, however, have a radically different opinion. According to them, the early Earth surface is pictured with abundant liquid water soon after its formation, perhaps as early as 4.4 billion years ago. Water is a key element for life, thus the early Earth might have been a tranquil abode for life to spring. Interestingly, the oldest evidence of life is found in rocks about 4 billion years old. A similar age is also found for the oldest known rocks. As a result, the first 500 million years (that is, from 4 to 4.5 billion years ago) of Earth's history eludes us. Was the Earth inhabitable during this epoch? Is the lack of an ancient geological record a by-product of forces that shape today's Earth, such as plate tectonics? These are fundamental questions to understand how our own planet evolved and, ultimately, how we came to be. In a paper recently published in Nature, we argue that the most likely scenario was mid-way between the Earth being an inhospitable orb and a tranquil abode (see Figure 1). Asteroid impacts were indeed numerous during the first 500 million years of Earth's evolution. They certainly brought widespread destruction on the surface. For instance, we compute that more than 10,000 asteroids larger than 10 km collided with the Earth, a size comparable with the asteroid that wiped out the dinosaurs (along with about three-quarters of plant and animal species!) about 65 million years ago. The effects of these collisions, however, were tiny, when compared with larger ones. We compute that the Earth was hit by about 200 objects larger than 100 km in diameter. Each of these collisions was at least 1,000 times more energetic than the one responsible for the extinction of dinosaurs. Figure 1. An artistic conception of the early Earth-Moon system. The Earth is pictured as surface pummeled by large impacts, resulting in extrusion of impact-generated deep-seated magma onto the surface. At the same time, distal portion of the surface could have retained liquid water. The Moon is pictured as a dry, heavily cratered body. The Moon is far less geologically active than the Earth and its older surface and rocks have been used to calibrate our bombardment model (click on picture for a higher resolution version of the movie). We compute that these large impacts would have melted large volumes of the Earth's crust and mantle. These volumes of deep-seated melt were unstable due to the various forces acting on them, and they might have poured out on the surface burying large surface areas under a thick layer of molten rocks (see Figure 2). One could picture this process as a gigantic volcanic eruption (a good analogy for this process, although not due to impacts, may be represented by the so-called large igneous provinces currently found in various locations on Earth). Any existing ecosystems were being roasted from above and from below! Figure 2. 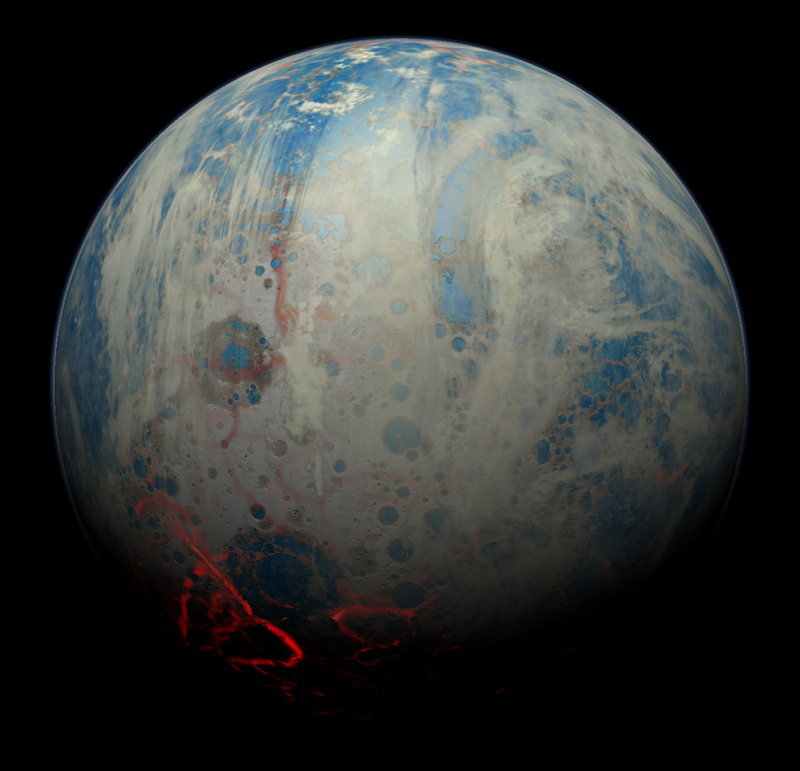 An animation showing the effects of bombardment on the early Earth. Each circle represents the area highly processed by an impact. The diameters of the circles correspond to the final size of the craters for impactors smaller than 100 km in diameter, while for larger impactors it corresponds to the size of the region buried by impact-generated melt, as described in the text. Color coding indicates the timing of the impacts. The smallest impactors considered have a diameter of 15 km. Despite this immense disruption, the effects of collisions including the large ones were mostly localized. There were at any given time ample areas where water could have existed. It is therefore conceivable that early life could have survived by migrating through stable niches during the Hadean. Whether these stable areas were suitable for life depends upon the physical and chemical conditions existing in these niches, which are not known. Our model also predicts that the Earth was hit by 2-4 asteroids larger than 1000 km. These collisions were so energetic that they are thought to result in global sterilization – pre-existing life would have been wiped out. 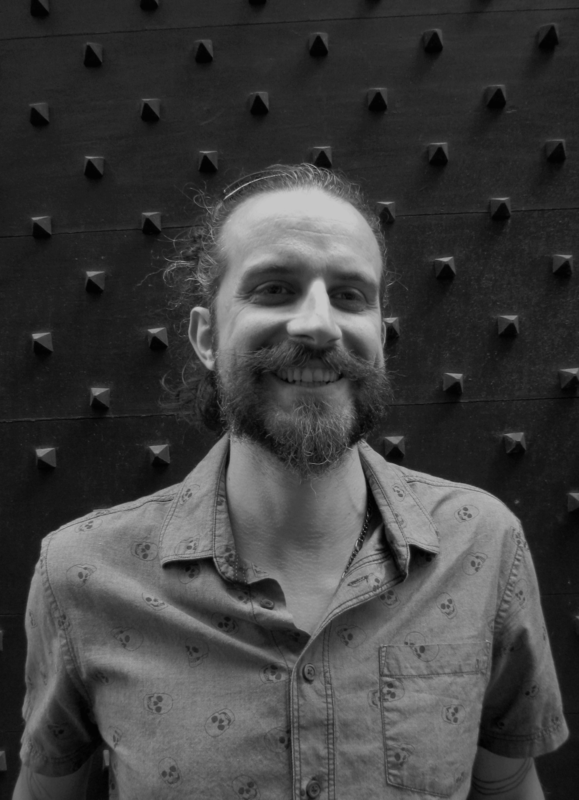 We used our model to track the timing of such collisions among a large number of simulations (we cannot reconstruct uniquely the bombardment of the Earth, thus a statistical approach is fitting). Interestingly, we find that the mean time for the last sterilization event is about 4.4 billion years ago. Thus, any life existing prior to this time would have likely been annihilated – starting all over again at a later time. The fundamental question of when life emerged on Earth continues to elude us. More work is needed to address in details the consequences for the environment during the early bombardment. Our work is a step forward toward that goal. Stay tuned for future developments. This research was published in the July 30th 2014 issue of Nature magazine (here). Mercury is a fascinating world. Among the terrestrial planets it is the closest to the Sun and, for this reason, its study has always been a challenge: both for ground-based and spacecraft observations. Mercury was observed at close range for the first time by the spacecraft Mariner 10 in the 70s. After more than 30 years of loneliness, in 2011 the MESSENGER (MErcury Surface, Space ENvironment, GEochemistry and Ranging) mission has inserted into orbit around Mercury enabling planetary scientists to perform unprecedented analyses of its surface, tenuous atmosphere, and interior. Figure 1. 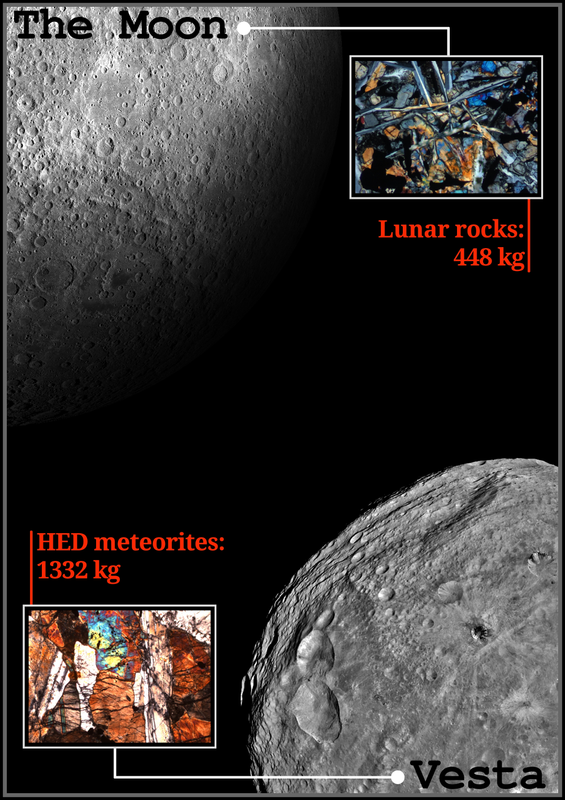 The animation compares the actual surface of Mercury, as seen by MESSENGER (left-hand panel: obtained using a publicly available mosaic of Mercury found here), to the crater areal density (right-hand panel: number of craters larger than 25 km averaged over neighbor regions of 300 km in radius). The crater density is shown in color, ranging from dark blue (minimum) to white (maximum). One may ask: so, what's the big deal? Well, first of all, this finding implies that the first 400-500 million years of Mercury's history (which is thought to have formed about 4.5 billion years ago, as supposedly for the Earth and Moon) are lost. In other words, something tremendous must have happened early in Mercury's history to erase its surface. What could that have been? Hard to say, given that the most ancient surface is lost (! ), and with it also the traces of what may have caused the resurfacing. However, additional indirect information indicated that voluminous volcanism took place on Mercury, and perhaps it was strong enough to wipe out its surface. Our work also suggests that this erasure could have been aided by the heavy bombardment itself. This research was published in the July 4th 2013 issue of Nature magazine (here). Fragments from asteroids provide an unique opportunity to study the processes that shaped the early solar system. 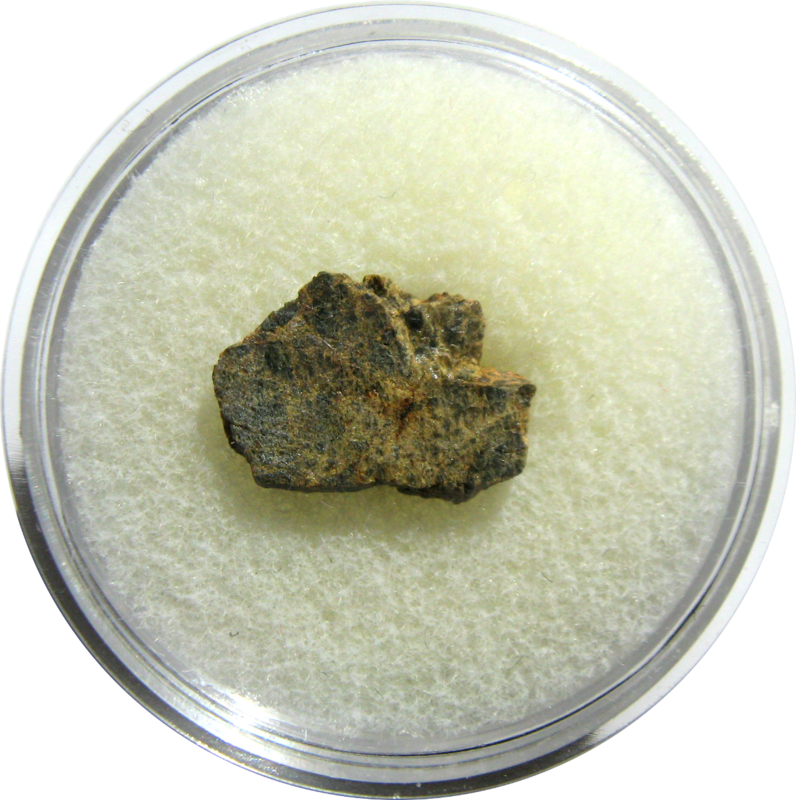 Some of these rocks, found on the Earth as meteorites, reveal signs of impact processes on their parent bodies, recorded as tiny variations in the amount of radiogenic elements, like the noble gas Argon (see Figure 1). Particularly intriguing are the signatures found in many chondritic meteorites (e.g. the ordinary chondrites enriched in iron), and in a major clan of achondrites (e.g. the howardite, eucrite and diogenites; originated from asteroid Vesta). Figure 1. Potassium and Argon. 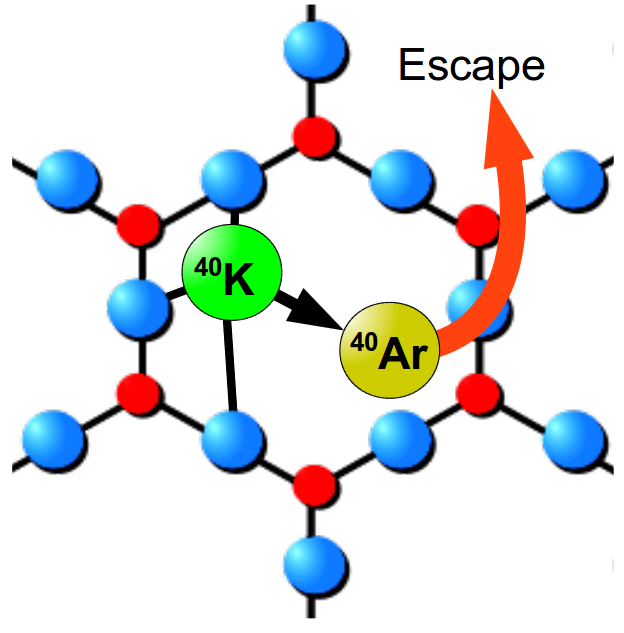 The noble gas Argon (Ar) entrapped in meteorites as a result of radioactive decay of Potassium (K) is widely used to constrain the time when major impact processes took place on the meteorites' parent bodies. Impacts produce heating that trigger Ar release from the lattice. Thus, the relative abundance of Ar (highly volatile) to K (less volatile) tell us the elapsed time since the last major impact. These ages are commonly called impact-reset ages. These rocks show signs of multiple impacts that took place about 4 billion years ago, during the so called "late heavy bombardment" or "lunar cataclysm", a characteristic also shared by many lunar rocks. Clearly, the Moon, Vesta and other meteorite parent bodies do not share similar collisional histories. In fact, objects like Vesta are surrounded by a large reservoir of asteroids, the Main Belt, confined between the orbits of Mars and Jupiter. These objects have orbits that often intersect one with each other, implying an high collisional rate. On the other hand, the Moon resides in a relatively quieter region of the solar system, where collisions with interplanetary rocky bodies are much more uncommon. Thus, how come that lunar rocks and several asteroidal meteorites share strikingly similar collisional patterns? Is that a mere coincidence or rather is telling us something profound? While this puzzling coincidence was long been recognized by several researchers, a satisfactory answer to this conundrum has only been suggested in a recent multidisciplinary work. Researchers have linked the lunar ad asteroidal datasets and found that the same population of projectiles responsible for making craters and basins on the Moon around 4 billion years ago were also hitting Vesta at very high velocities, enough to leave behind a number of telltale, impact-related ages (see Figure 2). Figure 2. Lunar and Vestan samples. The new research demonstrates how to use howardite, eucrite and diogenite (HED) meteorites, that originated from Vesta, to study the lunar cataclysm. Interestingly, the total mass of lunar rocks stored in our laboratories is approximately 448 kg. For comparison, HEDs sum up to 1332 kg. Thus, thanks to the new interpretation of HEDs impact-reset ages, this new work expanded by about three times the total mass available to study the lunar cataclysm. This novel interpretation of the howardites and eucrites was augmented by recent close-in observations of Vesta's surface by NASA's Dawn spacecraft. In addition, the team used the latest dynamical models of early main belt evolution to discover the likely source of these high velocity impactors, finding that the population of projectiles that hit Vesta had orbits that also enabled some objects to strike the Moon at high speeds. The findings support the theory that the repositioning of gas giant planets like Jupiter and Saturn from their original orbits to their current location destabilized portions of the asteroid belt and triggered a solar system-wide bombardment of asteroids billions of years ago, the lunar cataclysm. The research also provides new constraints on the start and duration of the lunar cataclysm, and demonstrates that the cataclysm was an event that affected not only the inner solar system planets, but the asteroid belt as well. The paper, published on April 2013 in Nature Geoscience, can be found here . I can tell you that doing this work was a lot of fun! Figure 1. Craters distribution on Vesta. 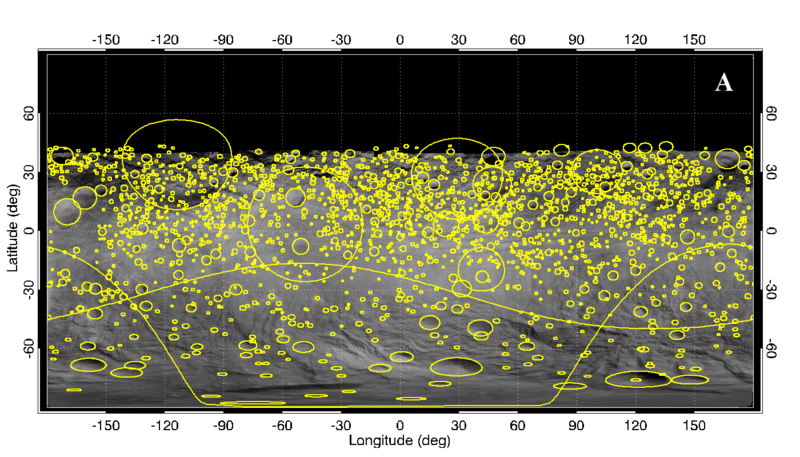 Every each yellow circle corresponds to an impact crater. This image contains 1872 craters. Note the two large craters that wrap around the south pole: there are called Rheasilvia and Veneneia and they both measure about 500 km across (Figure after Marchi et al, Science, 2012). The spatial resolution of the map is ~300 meter per pixel. Click here for the full paper. Since the publication of this work, Dawn has completed its operations at Vesta. In doing so, a better image resolution was achieved (down to 20 meter per pixel) and also better coverage of the northern hemisphere (in shadow in Figure 1). Figure 2. Diogenite "Tatahouine" found in Tunisia. 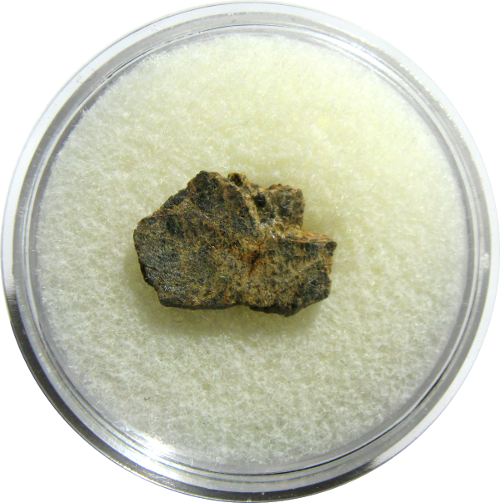 The parent meteorite fell on June 27, 1931 near the town Foam Tatahouine. Several fragments (for a total of ~13 kg) were collected afterward. The meteorite is also known as "Green Meteorite" given its greenish color. The fragment shown in this picture is about 1 cm wide. In addition to diogenites, eucrite and howardite (the latter is a mixture of the first two) meteorites are also thought to come from Vesta. Thanks to Dawn, we now have a better understating of Vesta and its link to the howardite, eucrite and diogenite meteorites. To me, one the most intriguing outcome of Dawn observations is that they clearly disclosed a body with two distinct "faces". There is the "young" face shown by the hilly and rugged southern hemisphere, while the northern hemisphere appears to be much "older" given its smooth and gently sloped surface as a result of eons of impact cratering. There is the "dark" face expressed by localized spot of low albedo (< 20%) opposed to the "bright" face where the albedo can be as high as 40%. Also, the composition is rather heterogeneous, from diogenitic-rich to eucritic-rich material. Figure 3. Animation showing the two faces of Vesta. Well, this is not exactly what Dawn saw at Vesta, but it helps visualizing the two faces of Vesta (the faces are a representation of the roman god Janus Bifrons on a coin, ~200 BCE). >> More stories to come soon. Check out this page regularly.